So this will be an ongoing type of feature on my blog as it's not a quick fix solution. We have recently moved house and unfortunate the dream rental wasn't quite as dreamy as we had hoped. The house was quite literally jumping with flees and I was super tasty. 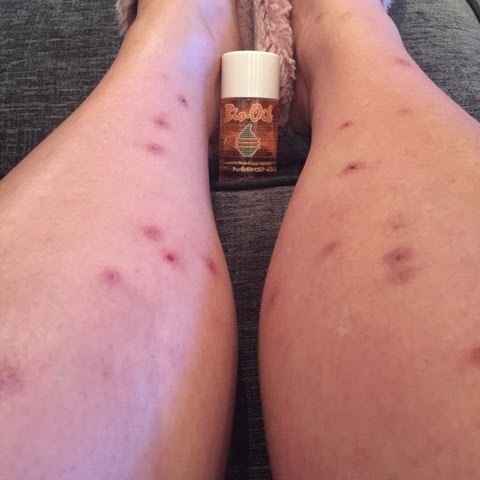 So I have asked bio oil to help me and they have kindly sent me my first bottle on my way to recovery and scar free legs. I will be checking in weekly to show you my progress. I will be using bio oil every day twice a day for 3 months. So keep your fingers crossed for my dinner legs to make a come back. Did you stick at the bio oil? If so were the results good?